Paleo Works: Live Life Like a Mountain Gorilla! Paleo, Caveman and real food diets. Nutritional coaching and weight loss consultants in Ilkley, Skipton, Keighley, Leeds, Bradford and throughout West Yorkshire. Sustained weight loss the way nature intended. Easy weight loss. Live Life Like a Mountain Gorilla! Did you see the Horizon documentary last night on fasting? Entitled "Eat, Fast and Live Longer", the presenter Michael Mosley explored the ancient science behind fasting as he set himself the challenge to live longer, stay younger, lose weight without changing his lifestyle. You should be. This is a very hot research topic in the battle against obesity related illness, diabetes 2, heart disease and cancer. Get your critical thinking cap on and take a look! This documentary reminds me of a man we know who says we should live life like a mountain gorilla. 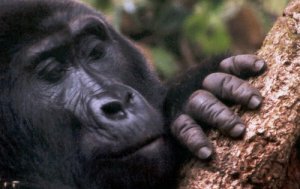 He tells a great story with it (which I have ignored) but his point is basically this: a mountain gorilla matures fast to adulthood and independence, lives a long healthy active life then dies gracefully at the end. Humans in contrast, spend ages maturing (some much longer than others, some never getting there), live a life of dubious health and well-being and then spend ages getting old and dying. Why do we do that? Answers on a post card please...but seriously, it doesn't have to be like that! The story is just an interesting reflection on the choices we make, on our habits of thinking and behaving. But how do you see your future? Share your thoughts, we would love to hear from you! Wot ? No comments yet ? OK, I'll bite. Found the programme really fascinating, made sense to me and am planning to give intermittent fasting a go. I ain't telling my doctor though as he said I was too overweight to go running. That was 15 years and hundreds of miles ago and I am still here. Counting calories is not my thing but fasting means you don't have to count ! Right up my street. 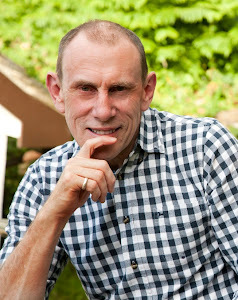 So here I am : 198lbs, 67 years old (today ! ), BMI of 28, fat % unsure. Started with a fasting day but am aware of birthday cake off stage left. PS I hate salads anyway. Well, one month on. How am I doing ? After a wobbly start, I settled down to a 4:3 intermittent fast. That is, 3 days fast and 4 days normal. On the fasting day I also modified the regime to just an evening meal to minimise domestic disruption. Conclusions ? The regime is a LOT easier to adhere to than calorie restriction on a relentless, dreary daily basis. As to specifics, I can only report that I have lost a slightly disappointing 7 lbs in weight. Other data I have not got. Have to take that on trust for now. OK. 5 weeks in; how am I doing ? Well after a couple of wobbles getting my 'fasting' days into a routine that avoid domestic disruption, I find I have lost 10 lbs in weight. BMI now 27. I can live with that. Has it been easy, this intermittent fasting regime ? Yes, compared with daily calorie restriction. Dunno what effect it has had physiologically yet; next checkup is in January 2013. My diet is hardly paleo but I AM eating much more fruit and a whole lot less dairy products volume. Well, it is now 2 months at the Alternate Day Fasting regime. What progress ? Largely stuck to the schedule with occasional hiccups, perhaps 2 of note. I blame Toby Carvery ! I still find it easy to maintain fairly religiously in terms of schedule if not always in terms of calories consumed. But the measurable proof of progress lies in my shrinking weight which is now 183 lbs (BMI=26). I started at 198 lbs 9 weeks ago. Reasonably pleased with that. I am taking vitamin and mineral supplements more or less daily just in case. I don’t miss chocolate or crisps but have been known to have a naughty biscuit or two (permitted under the regime but cannot be helpful). I do find myself drifting towards more ‘natural’ foods and even went looking for wood-pigeon a couple of times (it’s on the Sainsbury’s website but never in the store). I mean pigeon must be far more natural than the fat cattle roaming our green acres ? Or am I spouting paleo heresy ? Extrapolating into the future, at the present rate of progress I should be down to less than 12 st by the end of the year. Not been that weight since the 1970s. For more information visit our radical new website. Why We (Really) Get Fat! Take a look at this little gem explaining a key fundamental fact of which most of you will be unaware. That is the truth about why we really get fat. Healthy eating? 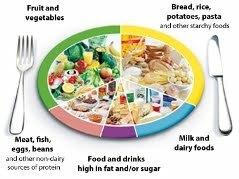 Sadly large parts of the NHS eatwell plate are anything but. Despite official advice, things like the Change 4 Life scheme, eatwell plate and NHS guidelines. Obesity in the UK is on the increase along with diseases like Diabetes at epidemic proportions. Why is this? Is there a solution? Standard advice is to eat less and exercise more. Can this be right? Well it's not worked to date so what do you think. Not just here in the UK either, globally the advice is much the same and yet present figures show we are at pandemic levels around the world. How can so many leading nations have got it so wrong? Why eat a Paleo Diet? Copyright - Paleo Works Ltd - All Rights Reserved -. Simple theme. Theme images by TommyIX. Powered by Blogger.